This large format screen for video projection, also known as a portable media stand, assembles in just five minutes with one person. 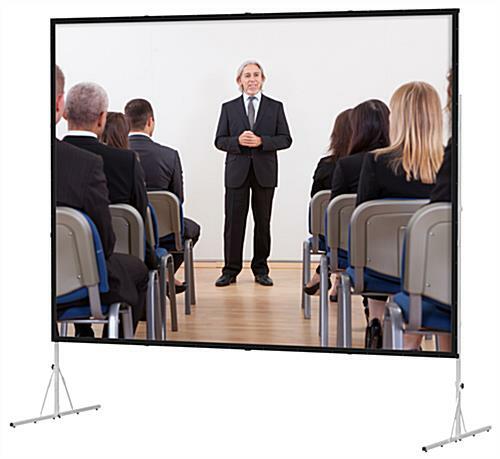 This commercial movie display measures 63"h x 84"w overall, so it's a great size for a trade shows, conventions, school and university auditorium lectures, and business office meetings. Static visuals are boring in comparison to moving images displayed on a screen for video projection such as the one featured here. Equipped with wheels, built-in handles, and a durable poly carrying case with handles that meets airline transport authority standards, this portable slideshow stand is a road warrior favorite. This durable viewing system has a 1.25" extrusion and folds via hinges into its carry case, unlike the retractable models. 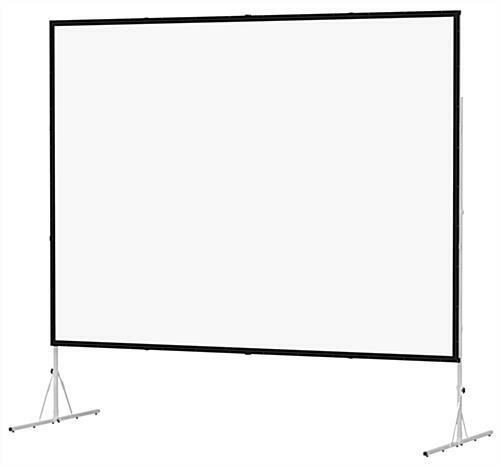 The 59"h x 80"w matte white surface of this screen for video projection mounts securely onto the sturdy aluminum frame. This commercial media display is so versatile, it doubles as a home theater. Take it on the road for family reunions to share old movies or slideshows from recent travel. 44.0" x 18.0" x 13.0"